I’m posting a contour drawing of a wonderful little girl formerly named Sorissa and now called Edie by her adoptive parents. She has such a smiling face and I was attracted to her black and white characteristics which will contrast with the light source. 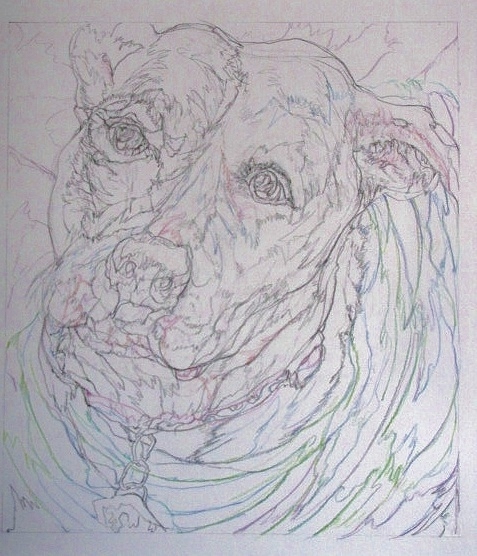 I am hopefully working to submit this piece to Deviant Art which is show meant to dispel the myth of the dangerous nature of the Pit Bull and Rottweiler. A wonderful example of the warm nature of these animals is Edie. The contour provides the framework for the watercolor and colored pencil drawing. It provides me with so much information about the light source, the form and color of the body under the fur that if I never saw Edie’s picture again, I could complete the work. I’ll show this in stages. You are currently reading Edie at Dr. Mary McNaughton and Drawing.